For anyone not familiar with yaby Cosmetics – yaby is a Canadian-based brand that was created by professional makeup artist, Liz Yu, for professionals and consumers alike. Their products save space by eliminating unnecessary packaging, which results in less waste in the landfills. Just about all of the products yaby makes fits into a refillable palette, and there are many different palette options. yaby’s Dramatically Neutral Eyeshadow Palette is a must have for anyone. This palette comes with 40 shadows in natural & blue colors can create just about any look for anyone. It is my go-to palette in my professional kit, especially for weddings. What these little shadows lack in size they make up for in color pigmentation and quality! A TINY bit goes a LONG way – no joke, especially when paired with an eyeshadow primer. They blend amazingly well and feel like silk. If you need to refill a shadow, the empty pan pops out so easily and the empty can be cleaned and reused for custom mixing. One of the very few problems I have encountered with the shadows is that they are so small, sometimes it is hard to get the product on the brush. However, they are small to conserve space & waste so it’s hard to really complain about the size. Also I noticed that the white palette compacts scratch and show scratches easily. However, it is nice to see packaging outside of black and it does stand out among everything else in my kit. 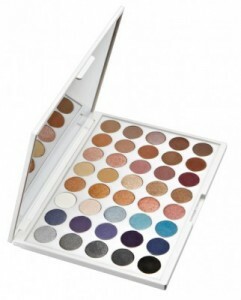 The only other downside is that some consumers may have a hard time with paying $127 CAD for a palette of eyeshadows. I assure you, they are worth every penny due to the quality. Besides, that comes to about $3.18 CAD per eyeshadow, which are all professional quality, not including the refillable palette. Not to mention that if you run out of your favorites, you can just purchase the refills instead of having to buy another palette.